Organic. 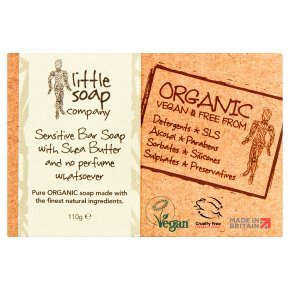 Pure Organic soap made with the finest natural ingredients. Free from detergents, SLS, alcohol, parabens, sorbates, silicones, sulphates and preservatives. Not tested on animals. Suitable for vegans. Unperfumed Soap with Shea Butter for Sensitive Skin Without fragrance, fuss or fanfare this soap has added shea butter, giving many benefits to problematic, oily or dry skin. Often it's the simplest things that work best.